The books of Hosea, Joel, Amos, Obadiah, Jonah, Micah, Nahum, Habakkuk, Zephaniah, Haggai, Zechariah and Malachi are known collectively as the books of the Minor Prophets. Doesn’t mean that they are minor in rank or influence or significance as compared to the Major Prophets – Isaiah, Jeremiah, Ezekiel and Daniel; but it merely refers to the length of the book that was titled after them. Even the longest book amongst these 12 are a lot shorter than the writings of Isaiah, Jeremiah and Ezekiel. It must be noted that while Daniel is shorter than Hosea and Zechariah, it is still considered part of the books of the major prophets. Don’t ask me why – it is the exception to the rule here I guess. Amongst these 12 books Obadiah is the shortest, in fact, it is even the shortest book of the entire Old Testament Bible. With only 21 verses, only 2nd and 3rd John are books with fewer verses. In other words, it is a very obscure book. The books of the prophets are generally a lot more unpopular compared to the epistles of the apostles, because they are so much harder to read. Yet there are perhaps most gems found in places we least bother to look. With only 21 verses, it is easy to pinpoint the purpose of the book – a prophetic vision of the fall of Edom, enemy of Israel. It first addresses the arrogance of the Edomites, and then prophesies about their destruction, and finally – as most prophets do, speak of hope in the restoration of Israel. In this study, we will look at the arrogance of Edom as described by the Lord and compared it to the arrogance in our very own hearts. The pride of your heart has deceived you – The human heart is very complex – physically and emotionally so. The heart is deceitful above all things and beyond cure. Who can understand it? [Jer 17:9] As much as we think and believe that we know ourselves and that we understand what we truly want, we often do not, for our hearts are fully capable of deceiving us. Because of irrational things called feelings, we become blind to what is right and wrong, and even common sense may fail us at times. For this people’s heart has become calloused; they hardly hear with their ears, and they have closed their eyes [Matthew 13:15]. 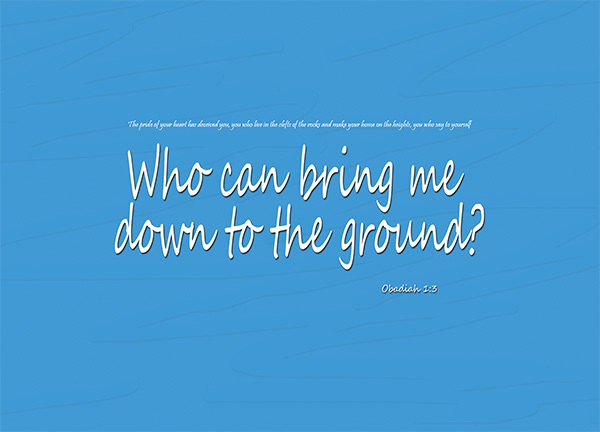 Who can bring me down to the ground – This is a scary question, because the higher you rise on the heights, the harder the impact you would bear when you fall. It’s frightening to me. And the least you expect to fall, the least prepared you are when you do fall, the greater the shock, the greater the hurt and impact again. Who can bring me down to the ground? If you really think about it, many people can. Humans can. The devil can. God can. Who are we, to rise up so high in the first place? Isn’t this just like the story of the three little pigs? Build a house of straw and twigs and be deceived and deluded by your own heart and pride into thinking that you are safe. The wolf came, he huffed and he puffed, and the house was gone, and the pigs were eaten up. Or the story of the foolish builder, who refused to listen to the good word and instead built his house on sand. The rain came down, the streams rose, and the winds blew and beat against that house, and it fell with a great crash [Mt 7:27]. you who live in the clefts of the rocks and make your home on the heights – I used the three little pigs analogy earlier, but perhaps it wasn’t all that appropriate in this case. Clefts of the rocks basically means in the cracks or dents of the rocks – building your houses on a false sense of security. It was not that you were stupid enough to build your house with straw or build your house on shifting sand. No, you had knowledge, you were smart, and you know you were smart. In the Bible story of the Wise and Foolish Builders, the wise builder was said to build his house on rocks. The rain came down, the streams rose, and the winds blew and beat against that house; yet it did not fall, because it had its foundation on the rock [Mt 7:25]. Edom’s position was strong. It prided itself on it being a fortress, impenetrable. A bit like how the Titanic was supposed to be unsinkable. Yet this sense of security, this physical and humanly security stands not in the way of God’s judgement against them. It will not save them against the waves of God’s destruction. Your pride will be your downfall. My pride will be my downfall. Our pride will be our downfall – One’s pride will bring him low, but he who is lowly in spirit will obtain honor [Proverbs 29:23]. Edom was not the only example of having a false sense of security through building a fortress. I am against you, Jerusalem, you who live above this valley on the rocky plateau, declares the LORD– you who say, “Who can come against us? Who can enter our refuge?” [Jer 21:13] The terror you inspire and the pride of your heart have deceived you, you who live in the clefts of the rocks, who occupy the heights of the hill. Though you build your nest as high as the eagle’s, from there I will bring you down,” declares the LORD [Jer 49:16]. Were they all brought down? Yes. False sense of security. Men often lapse into a comfortable position that gives a comfortable outlook on life. Oh, my company cannot do without me. I’m indispensable. Oh, my house is safe. I’ve the state-of-the-art security system. Oh, nobody will find out about my adultery. I always set up a perfect alibi and nobody can possibly catch me. Oh, my girlfriend will never leave me. I provide for all her material needs. Who can disturb my comfort? Who can thwart my plans? It is often when we find ourselves in a false sense of security and taking God’s grace for granted that we create the beginning of our own downfall – through pride. He mocks proud mockers but shows favor to the humble and oppressed [Proverbs 3:34|Article]. Let us check our hearts again – let us not mistake pride for normalcy.